For a relatively youthful organisation, we are very proud of what we and our members have achieved in the last few years. 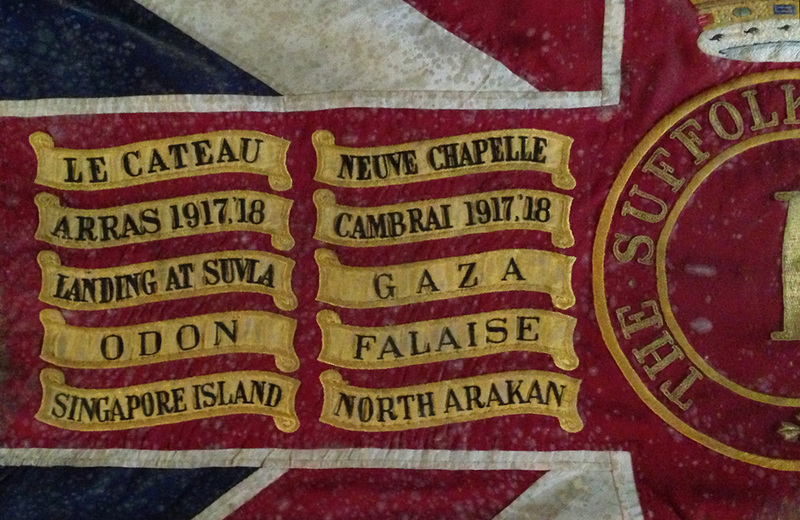 Below are just a few things that we have done to ensure that The Suffolk Regiment will not be forgotten. 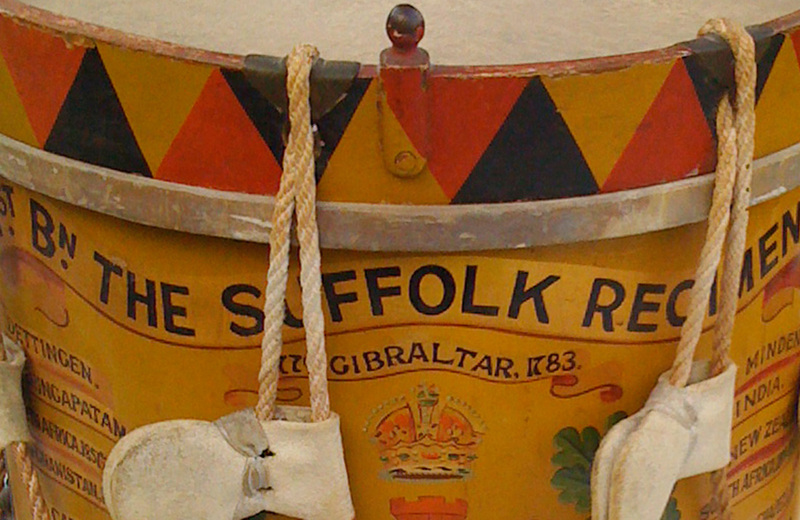 Late in 2004, a Suffolk Regiment drum appeared on eBay. All Suffolk collectors looked on with envy to see what it would fetch. However, the auction was to end early. After a great deal of frantic research, the conclusion was that this drum was something rather special and needed saving for the Regimental Museum. The drum carried no Second World War Battle Honours and appeared to have not ever been re-painted. After the war, all remaining drums of the 1st Battalion were re-emblazoned with new Honours gained between 1939 and 1945, but this one was totally untouched. It could only therefore be, one of the three drums that were hidden at Roubaix in Belgium in 1940, when the Battalion retreated to Dunkirk, that were then recovered again in 1944. Everyone was excited as without the quick thinking of the Trustee's, this important and valuable item of Regimental History may have been lost forever. In December 1944, as 1/Suffolk fought through the Low Countries, they passed again through Roubaix. Captain W.N. Breach, who had sketched the position where he had hidden them in 1940, took three men back to try and recover the drums. Asking at the Town Hall, the Mayor greeted them "I know what you have come for, look behind you", and there was two of the drums, perfectly preserved. A third was later recovered after the local resistance dug in an area marked on an original sketch map. In 2010, the drum was added to the BBC's 'A History of the World', a website created in conjunction with the British Museum that records some of history's most important but unknown objects. 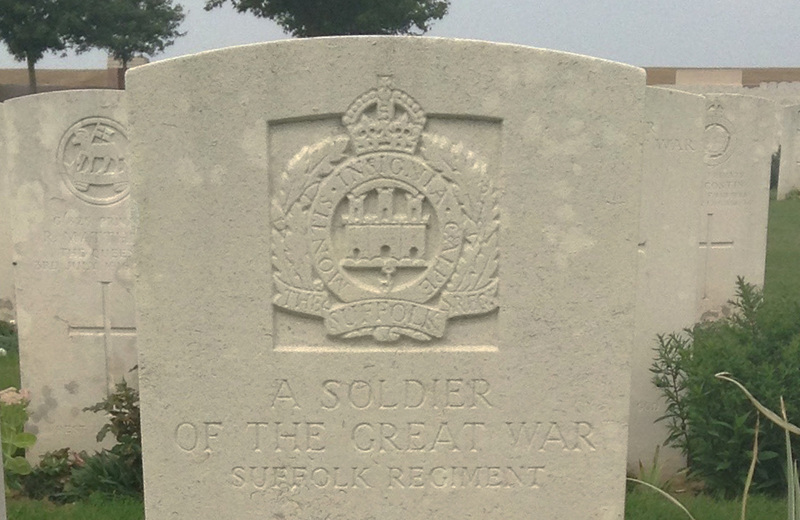 In November 2015, the Friends learnt that one of its members had been successful in getting the Commonwealth War Graves Commission to recognise a Suffolk Regiment soldier who died in 1916 and who had for 99 years, been lost to history. Private Thomas Ebner Elmer died in the Depot hospital at Bury St. Edmunds on 24th March 1916. He had enlisted just five days before, when he died suddenly before his training was due to commence. His death was attributed to heart failure and he was buried in Bramford cemetery with his family attending. As he had not been issued a service number, had not gone overseas, nor had any medals been awarded to his, his death was not recorded in any of the familiar places where regimental historians look. Through the valiant efforts of Kelvin Dakin; co-founder the ‘Bramford in the Great War’ Project, his story has finally come to light. His service for his country, albeit brief, has been formally recognized and he will now be added to the CWGC register of war dead. 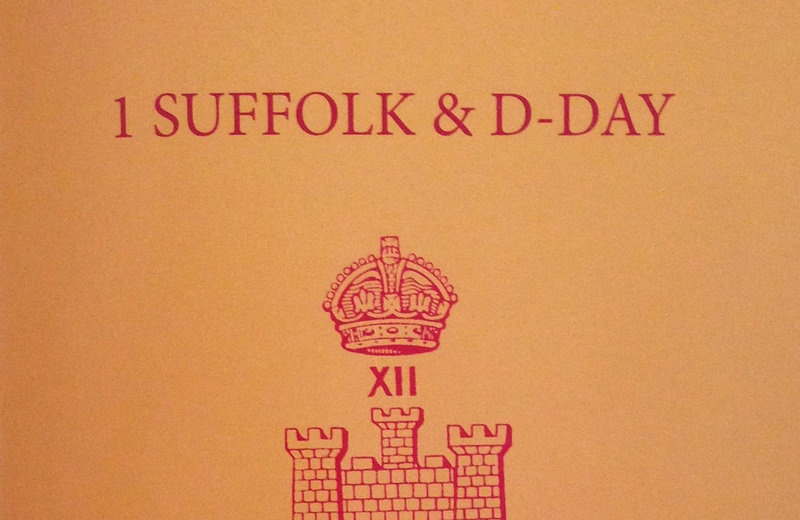 Not since 1955 has a through and comprehensive study been made of the Colours of The Suffolk Regiment. With the move in June 2014 of the Regimental Cenotaph from St. Wolstans Chapel, in St. Mary's Church, the need to save the Service Battalion Colours from damage during the work, became ever more important. Thus, with the temporary removal of these Colours from the chapel, it was decided that a thorough study should be made as to their condition, along with the other Colours of The Suffolk Regiment that hang in the church. At the request of the Regimental Council, the Friends undertook to remove the Colours one by one in order, to bring them down to be photographed, measured, evaluated and recorded before being rehung in their original positions. The two sets of framed Colours of the Regiment were evaluated also. It was as tough and dirty job, scaling the ladders some 30ft up to bring down the Colours, but the Friends were pleased to have been asked to undertake such work and to record for the first time in full colour, the surviving Colours. In 2015, the Friends were instrumental in republishing Lieutenant-Colonel Eric Lummis's seminal work on the 1st Battalion's action son D-Day. To the best of our knowledge, just one printing was made of his booklet. A small addendum was added as a slip-in sheet in 1994, correcting a few spelling mistakes and misspelt names, but as copies gradually sold out in the Regimental Shop, the need to reprint Eric's work became of paramount urgency. There was however a problem. Eric's work was originally a black and white, carbon copied, typewritten booklet, published long before the advent of digital publishing. With no master file, the Friends stepped in to transcribe Eric's original text and convert it into an electronic format. It is now available to buy from the Regimental Shop and via the Regimental Museum's website. Back in January 2012, Taff travelled to Thailand to assist in the making of a TV advert for Camelot and The National Lottery as part of a new scheme called "Heroes Return" whereby veterans can apply for grants to return to the places where they served. 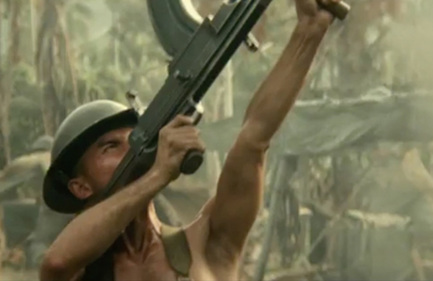 The story of the advert, focuses on one veteran who returns to a cemetery in the Far East, where, upon hearing the water sprinkler is transported back to the jungles of World War Two to relive a firefight with the Japanese. As the horror of the memory unfolds, the veterans finds himself back in the cemetery staring at the grave of a lost comrade being comforted by his daughter. A very moving piece of television. The story is based upon that of Jack Jennings, formally of the 4th Battalion, The Suffolk Regiment and later the 1st Battalion, The Cambridgeshire Regiment. Jack was captured at Singapore in February 1942 and subsequently spent three and a half years as a prisoner of the Japanese. Friend Taff Gillingham was approached to act as Historical Advisor on the advert and to help source the necessary uniforms and equipment required for the production. Keen to get the detail exactly right, original examples of uniforms and equipment were sent out to Thailand in advance so that they could be copied exact in every detail for the advert. From aertex battledress jackets, to slouch hats and even cotton webbing, everything was faithfully reproduced. The exceptions being a copy of the Regimental Gazette (which can be seen burning in the advert) and a 2nd Battalion flag; which was copied exactly from the original framed in the Regimental Museum. The advert premiered on television in February and a long two minute version was released the following month for viewing in cinemas. To find out more about funding from the Big Lottery Fund's Heroes Return 2 programme, please visit www.biglotteryfund.org.uk/heroesreturn. The advert can be found on youtube. 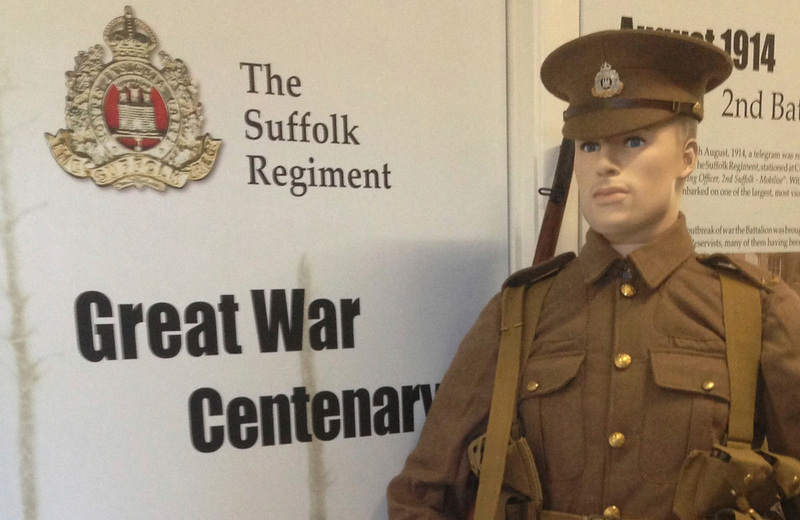 Over the period of the Centenary of the Great War, the Friends in conjunction with Khaki Devil, are providing a series of figures dressed in the ever-changing array of uniforms that The Suffolk Regiment wore during the conflict. The first figure on display is a Reservist of 2nd Suffolk, dressed in brand new uniform and equipment, just as it would have been issued to him on 5th August 1914. It is fitting that a Reservist has been chosen as the first Suffolk soldier to represented since the building where he now stands, was once the 'Reservists Clothing and Equipment Store' and it would have been here that 100 years ago, Reservists would have been issued their identical kit. Next year the figure will change to a soldier of the 4th Battalion portraying how they have looked at the battle of Neuve Chapelle in March 1915, then after this, a figure of 1/5th Suffolk at Gallipoli, then....well who knows! Daffodil Sunday, usually the first weekend in April, was the time when the Depot threw open its gates to the public to come and see how the county regiment lived and worked. Tours of soldiers accommodation, gymnastics displays and tea in the Officer's Mess were the highlights of the day. 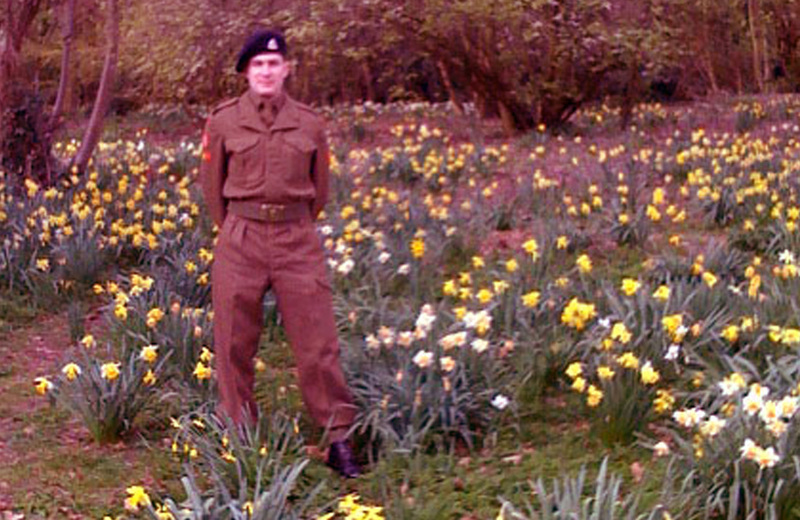 In the 1960s when the army moved to Barnham and most of the former barrack site was pulled down, the day became lost to history until in 2009 when 50 years after amalgamation, the woods around the old Depot site were once again awash with yellow as the daffodils of the old XIIth came back into bloom. Gripped by the idea of resurrecting it, the Friends with the help of museum attendant Tim Davies and Hon. Curator Gwyn Thomas, set about getting it going again. The site was opened up and signs erected to guide people around the footings of the last remaining pieces of the site and to show people just how much of our important regimental Depot still remains. The barrack blocks may have gone, along with the Sergeant Majors house, the coal yard, but the parade ground still remains (just!) along with a curiously shaped piece of ground known as the 'Egg' which was an island of rare trees and shrubs in front of the Officer's Mess. The museum was open as usual as it was the first Sunday of the month and a record 206 people came through the door. The DCM (Distinguished Conduct Medal) won by Corporal Bill Price was purchased at auction by a Friends member who has presented it to the Suffolk Regiment Museum. Completely by chance in June 2010, we learned that the DCM and accompanying GSM (General Service Medal) won by Bill Price of 8 Platoon, C Company in Malaya were going up for auction on 8th July in London. The Chairman of Hemel Hempstead Branch of the Old Comrades Association and comrade of Bill's, contacted the museum ask them to bid for the medal for the Regimental Museum, and with encouragement from the late Brigadier W.C. Deller, who served in Malaya, the Trustees agreed to bid a maximum of £12,000 for the medal plus the Buyer's Premium. Because of the rarity of a post-war DCM (the last being awarded to the Regiment for action in NW Europe 1944-45), it was felt within the medal collecting community, that it would fetch as much as £30,000 since it was one of only four DCM's won by National Servicemen during the Malayan Emergency. On the day, the trustees were outbid at £12,500 but then a Friends member stepped in to bid £13,000. To the auction rooms amazement, the bidding promptly stopped, and we managed to secure the only post-war DCM awarded to the Suffolk Regiment. When the hammer came down, the total paid was £16,055. On Minden Day 2010, the medals were framed and presented to The Suffolk Regiment Museum for Bill's family and his old comrades to see. Bill's daughter, Denise and her family travelled up from London to see her dad's medals now hanging proudly on display in the Malaya section of the Regimental Museum. 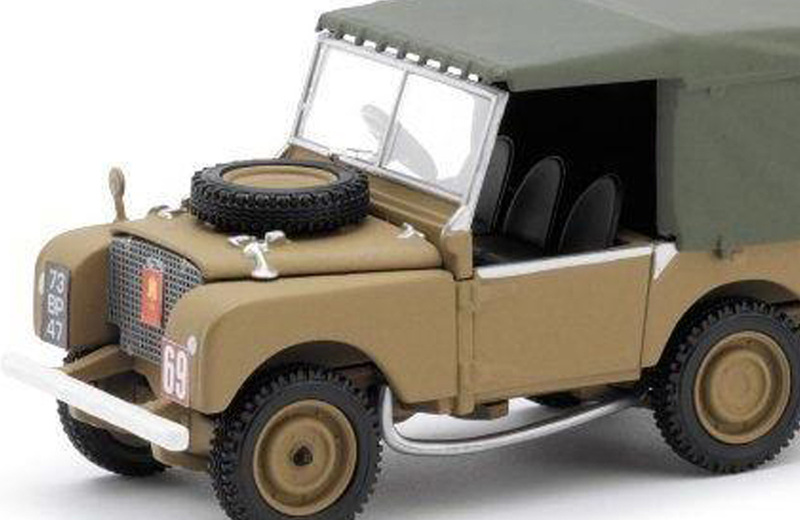 Through the grapevine, we heard that Corgi Models were about to scrap the die tooling for their Series 1 Landrover since they could not find another scheme for the model. The dies had previously been used in the guise of a Yorkshire Police Landrover and before that, an early AA recovery Landrover. Friend of the Friends, John Lakey, who worked for BBCs Top Gear programme, contacted Taff to say that they would scrap it unless another scheme could be found for it. Racking our brains, we could see that 1/Suffolk took delivery of them in Cyprus in May 1956. With careful research as to the colour scheme and the studying of as many original photographs as we could find, we sketched out the location of the necessary logos (Gibraltar Castle on the front grille and ID No. 69 on the front right) and sent it off to Corgi. Months passed and we forgot all about it, then on eBay one day in China, we saw that the model was launched. Production of a strictly limited quantity of 2000 was commenced in May 2010, with them selling like hot cakes on all the major model retailers website. All models come in an individual box with a small fact card about the model and the Regiment. The Bury St. Edmunds branch of the Old Comrades Association asked the Friends for assistance in repairing their old branch standard which was over 25 years old and now in need of a little TLC. The standard, known as the "Stabilis Standard" was presented to the Branch by 5835625, Ex-Sgt Jack Doughty at the Minden Reunion Dance, 2nd August 1986. After years of service, it was a little worn and dirty and in places, the fabric had worn through from the front to the back. After taking the standard to the conservators, an initial cost in excess of £1000 was estimated to have the standard dissected and its major components replaced on a new background. This was far too much for the Branch to spend and in desperation with Minden Day approaching, they asked the Friends for assistance. Liking a challenge, we felt that we could help them with their task. Within days, the old logo (identical to the O.C.A. lapel badge) was removed, and piece by piece, each letter from both sides were replaced onto new backgrounds. With the two sides sewn together, the old fringe reinstated, and a new pole sleeve attached, the standard was delivered back to the Branch the week before Minden Day. Cost - no more than £40.00 for raw materials and cottons. It is great to see it, along with the standards of all the other branches of the O.C.A. on Minden Day each year and the Friends are proud to have been asked to undertake such a unique regimental commission and consider it an honour to have been able to keep in service for another 50 years, the third oldest standard in the Suffolk Regiment Old Comrades Association. An invite came in November 2014 for the Friends to attend the Stars of Suffolk awards at the new College, Ipswich. The Regiment had been shortlisted in the armed forces category and such to our surprise, we won, despite being up against some pretty tough opposition from units still in existence. Suffolk regiment veteran Stan Lucas was at the ceremony, Stan laving served in Palestine with 1/Suffolk in 1948 , along with the youngest Suffolk soldier to serve in Cyprus, museum attendant, Tim Davies. We were asked to accept this award on behalf of all surviving member of The Suffolk Regiment. It remains our greatest honour. In early 2009, the Regimental Museum were given a most magnificent glass display case from our good friends at the Essex Regiment Museum. A quandry ensued as to what should be put in it. It was felt that as the largest amount of surviving members of the Regiment were those who served in the Malayan Emergency, the case should feature a diarama of that campaign. No higher point in the Regiments three and a half year campaign was attained than when, a patrol of 5 Platoon, under 2/Lt. Raymond Hands, eliminated the notorious communist bandit, Lieu Kon Kim; a man they had chased for over two years. However this was to be no easy task. With only a handful of pictures of Ray on the day of the successful patrol, evidence as to his appearance was limited. The Friends set about trying to find as many surviving members of 5 Platoon as they could. From these interviews and from several albums and period journals, a better picture of what Ray was wearing that day was drawn. From our own collections, the Friends assembled the necessary items of uniform and equipment required to recreate the actions of that day - an original American M2 carbine was sourced, along with original rubber and canvas jungle boots and even a jungle green bush hat, complete with a painstakingly reproduced B Company shield. Once posed and sketches were made, the whole lot was sent to London to be assembled by Darius Wilson Associates, before being brought up to the Keep for final tweaking by us and then the official unveiling. It was planned to be opened by Raymond Hands himself on the 5th July; the anniversary of the eventful patrol, but owing to ill health, Raymond was unable attend. It was unveiled on Minden Day 2009 in the presence of the Mayor of Bury St. Edmunds and Brigadier Calder, OBE, President of the Suffolk Regiment Association, by Major F.A. 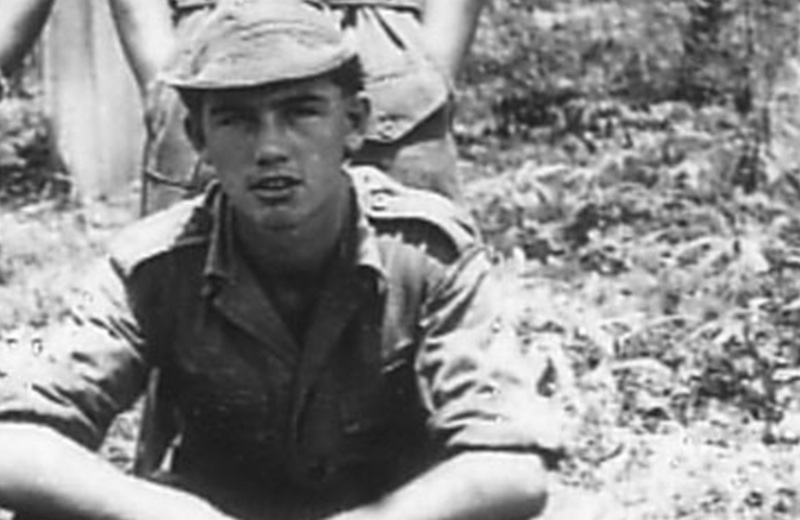 'Bob' Godfrey, MC, himself formerly of 1/Suffolk and a veteran of the Malayan campaign. The idea to recreate the Easter Sunday service came to Friend Taff Gillingham, who as a small boy, was gripped by the image shown in the Regimental History of the church service held on Easter Sunday, 1917; the day before the main allied offensive began in 1917 at Arras. In the late 1990s, Taff went on a battlefield tour to the caves under the town destined to try to find the exact spot. Armed with nothing more than the sketch opposite from the original history, it would be a daunting task. Since there were over 10 miles of tunnels and the possibility that some heavy 'artistic license' may have been used, finding the exact spot would be like finding a needle in a haystack. However by some fate, as Taff rounded a corner, he came upon the spot and amazingly it was all still there untouched. All the telegraph wires were still in position and '5E' was still painted on the chalk pillar. Even more remarkable, was the black soot marks left in the chalk that morning by the altar candles of the Rev. G.C. Danvers, Chaplain to 2/Suffolk. 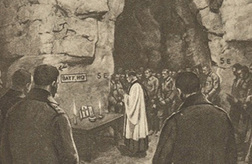 With the assistance of the 'Khaki Chums', a group of authors, historians and collectors, the church service was recreated at 11.00am on Easter Sunday 2007, exactly 90 years to the minute after the original. After the moving service, the Chums, fully equipped for battle in complete uniform and equipment of the 1917 Suffolk soldier, from woollen underpants to Mills bombs, to the correct coloured shoulder straps for the different companies of 2nd Suffolk, they filed out of the service, dumped their greatcoats in a heap (as mentioned in the War Diary) and filed up into 'Circular Trench' via exit 10 into the main tunnel system. The cave has now been opened to the public and special lighting and walkways erected. Therefore, the event will never be recreated again. The BBCs 'Inside Out' programme came along to film the proceedings and it was shown in late November 2007 in the Eastern Region, putting the Suffolk Regiment back on prime-time television for the first time since Amalgamation was the headline 'act' on the launch night of Anglia Television in September 1959.